This amazing tourist attraction located in the Alps is a must see for anyone interested in green building. 90% of the energy used by the building is produced by the building itself, making it very energy self-sufficient building. Much of this energy is produced by solar power. The Hut is also really innovative in its architecture and has stunning wooden interior design. The location is really amazing as well and there are a lot of things to do around the building. There is also a lot of innovation in the corporate world regards to environmentally friendly building. 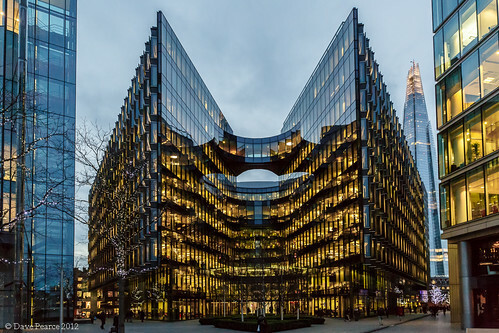 One of the best buildings in corporate use as well as being eco-friendly is the 7 More London building. This uses a lot of green technology and it uses bio-diesel fuel to provide energy to the building. The Standard writes about the innovations in the building and how it combines a lot of clever architecture as well. There is a hotel inside the building so it is worthwhile to book yourself a night next time you are travelling to London. One of the biggest innovations in architecture and construction are taking place in the Arabian Peninsula at the moment. One of the best eco-friendly buildings you should see is the Burj Al-Taqa, which is 100% self-sustained energy wise. It uses solar and wind power and doesn’t produce any emissions at all. This makes it a really great technological innovation. It also uses the nearby sea air very cleverly to air condition the building. If you want to learn more about the environment and climate it is a good idea to go and see the Eden Project in Cornwall, UK. This amazing building is a mini-structure of the eco system and will teach you a lot about the planet. It uses ETFE panels in a very clever way and these are a new great innovation in the eco-building field. You can look for more information about the product from Vector Foiltec. Australia also has its fair share of eco-buildings and there is a great building in Melbourne called the CH2. It uses the sewage system in a clever way and it is a real showcase of how you can build in a sustainable way and receive great end results. The above five buildings all have a lot of good qualities to them and there is a lot we can learn from these projects. The innovations and techniques used in the building can help push the green innovations even further. They can help architects take sustainable living even further and guarantee we will keep building in an environmentally sustainable way. Jenny loves to combine her two loves together. She is a passionate fan of environmentally friendly living and loves to travel as well. She is always looking for new destinations to go to and loves to explore new cultures.